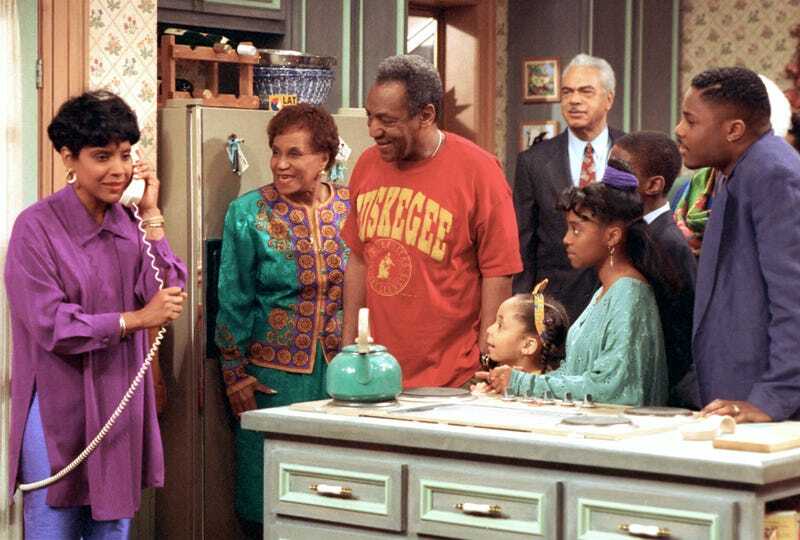 Phylicia Rashad as Clair Huxtable talks on the telephone while Bill Cosby, as Dr. Cliff Huxtable, and other cast members of The Cosby Show gather around during taping of the final episode in New York City on March 6, 1992. Bounce TV, a network geared toward African-American viewers, has removed reruns of The Cosby Show from its lineup following Bill Cosby’s conviction on three counts of aggravated indecent sexual assault Thursday afternoon. Deadline reports that the move to drop the classic 1980s sitcom was announced by the digital network in a statement Thursday. “Effective immediately, Bounce is removing The Cosby Show from our schedule,” read the statement. The network only began broadcasting reruns of the once omnipresent sitcom in 2016. Other broadcast stations and cable networks, including TV Land and BET Centric (now BET Her), began dropping the show in 2015, when the wave of sexual assault accusations against the disgraced comedian and pop-culture icon began cresting. Some speculate that more networks and streaming services will follow suit. Currently, The Cosby Show can still be streamed on Amazon.com, although it’s unclear for how much longer that will be true. Cosby, who faces up to 30 years in prison, is currently awaiting sentencing, which could take up to several months.